Do you remember when I said work was pretty calm? This has not been a great week--without getting too specific, which I can't, suffice it to say that there is someone who is making me a little miserable. So the title of this post is what I wish I could tell this person, possibly in less polite terms, but can't. It's also about a much more pleasant topic, the stuffed eggplant that I made on Sunday. I like eggplant, but it has to be cooked correctly. I've had some bad deep-fried eggplant experiences, along with some sauteed eggplant experiences that left me wondering why the vegetable had the texture of a foam pillow and approximately the same flavor. This is not either of those experiences. This is the eggplant to serve the doubters who say that they don't like eggplant. It's full of flavor and so many goodies that it will bring those doubters to their knees. As an aside, I've been loving cooking from the Lidia's Italy in America cookbook (you can find other experiments with that cookbook here, here and here). I rarely follow the recipe exactly, but I think the recipes are a great framework that can be altered according to taste, season and what you have on hand at the time. Her savory recipes often contain more olive oil than I think is absolutely necessary, so I usually scale back to keep things healthier. The original recipe uses small eggplant; I used one medium eggplant, which would feed four as a side or two as a main course. Preheat the oven to 400 degrees. Cut the eggplant in half and scoop out the flesh to make a shell. The shell should be thick enough to hold its shape but thin enough to allow plenty of stuffing to go in it; 1/2 inch is about perfect. Coarsely chop the removed eggplant flesh. Warm two tablespoons of the olive in a large skillet over medium heat. Add the onion and cook until golden, then add the chicken sausage and use a large spoon to break it into small chunks. When the meat starts to brown, add the wine. Cook until the meat juices and wine are almost gone, then add the bell pepper, chopped eggplant and 1/2 teaspoon of the salt. Cover and cook for about ten minutes, or until the bell pepper and eggplant are very tender. 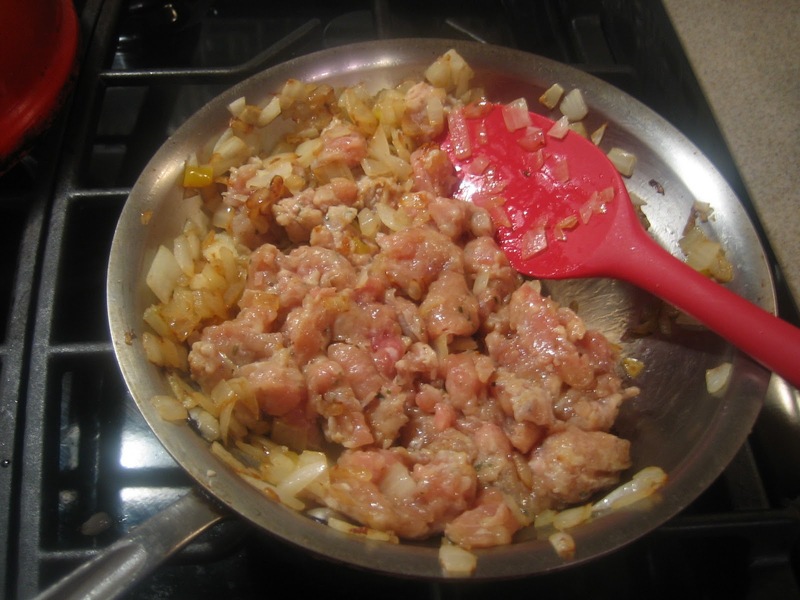 Once this mixture is cooked, remove from the skillet and set aside. 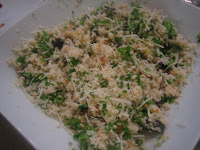 Combine the milk and bread crumbs in a small bowl and stir to combine. Then add the bread mixture to the cooled meat mixture, along with the cheese, parsley and sun-dried tomatoes. Place the eggplant halves snugly in a baking dish and then drizzle with the remaining olive oil and sprinkle with the remaining salt. Mound the eggplant halves with the stuffing, then cover with foil and cooking for approximately forty minutes, or until the eggplant is very tender. Uncover the dish, sprinkle with a bit more cheese if desired and bake for another ten minutes uncovered. Sorry your week has been rough :( It's the first week of a new semester, so I can relate (I've already dropped a class). This dish looks like a great way to cheer up, though! I've had a vegetarian spin on this that was delicious, so I know this must be great too. Sorry someone is aggravating you but you made me laugh out loud with your explanation of the title. Your recipe sounds great...I agree that oftentimes you don't need as much oil as is listed in a recipe. Can't wait to try it. Thanks for the sympathy, you guys--I feel fortunate to be able to tell you that this is not about a co-worker. They're actually pretty fabulous, which is what is making the situation bearable. I have not had a lot of success with eggplant, so finding this may change that situation. Never thought of stuffing them, but they look delicious. I will need to try this. I hope that the person does not ruin your whole week-sounds like you need a break away from their company for awhile! It only takes one! Hang in there. I love the looks of this eggplant and I adore the stuffing ingredients! Sounds delicious! I looove eggplant, so I eat it almost any way, but I have to say this looks gloriously decadent :) And if you exchanged the sausage for soy crumbles, it'd even be vegetarian! Nice recipe! Oh there is always next week to be better and brighter! 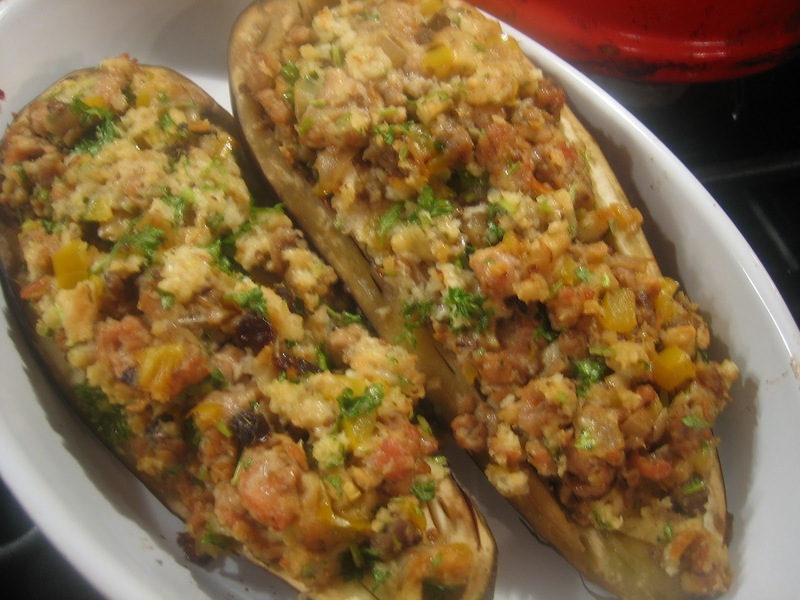 Your stuffed eggplant look incredible..Love the stuffing too! Well done sweetie, try to relax and this week will pass in no time. Sending you hugss!!! Sorry you had a bad week. I've had a few of those lately myself. This looks great. I never thought of stuffing eggplant. I normally bread them and bake them, or I cut it up in a sauce, or grill it. I will have to try it and have a better day tomorrow! Sorry you're having such a rough week! At least this gave you a few moments of comfort! I hope things clear up at work soon...I'm sorry you're having a tough time! The eggplant does look delicious, tho! We are over the top with eggplant, anything from into curries, stir fried, made into spicy side dish etc etc and I can go on further. I will want to try this which is a different version as over here only have cheese for bread not into cooking, I mean not for me. Nice and looks goods and sure a try esp when my hubby is around so that he too can taste this version of eggplant you have shared. Ugh, why do some people have to be so difficult? Hope the situation improves. But on a better note, your stuffed eggplant looks amazing...Lidia is such a wonderful inspiration for us all! I'm so excited about this recipe. I love eggplant everything! Hope your work situation gets straightened out soon. Oh wowwwww. This has seriously got my taste buds on full alert. I am in love with this idea. I think that stuffed is the only way I have not had eggplant. It looks and sounds wonderful. I am going to have to remedy that deficiency pronto!! When I visited Palermo 10 years ago I've tried some eggplants cooked in tomato sauce and sprinkled with cheese and they were just out of this world. i love eggplants but my son belongs to the doubters so I am keeping this to try and convince him that they do worth a second chance! I love that you took your frustrations out on your Blog Post Title - see don't you feel better already, I am sure you felt 10 times better after you ate this eggplant - it looks so so good! some times people can be difficult, hope you are feeling better! 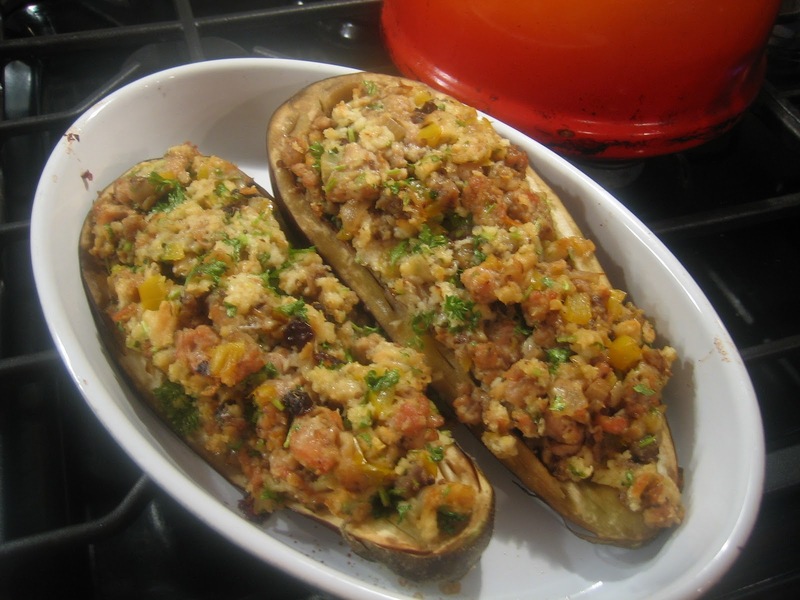 I love this stuffed eggplant looks great! Hope things better for you at work... love the title of the post!! It works for your situation. :) I love eggplant and and this looks like a delicious way to enjoy it. It's such a drag when people get out of line at work. They say the best revenge is living well, and it looks like you helped yourself to a healthy portion with this eggplant recipe! Very nice! I'm a recent convert to the pleasures of eggplant. I'll be trying this recipe for sure! This is an amazing eggplant recipe. I loved the stuffing. Yes, very true: an eggplant, if not cooked correctly, does taste funny! Thanks for the wonderful post!! I hope everything will work out for you. I'm sending positive energy! I always love eggplant even after I develop some kind of allergic reaction after mid 20s. I still eat it as long as the portion is small. Anyway, this recipe is a keeper. Looks fantastic! I'd love to try this. For purely selfish reasons, I hope more people tick you off if it inspires you to make DELICIOUS food like this! Bookmarked! I agree that eggplant can be tricky. Sometimes it withholds its flavors but this is indeed wonderful. And you know - you really can't go wrong with Lidia! Wow, this recipe looks amazing! The sausage stuffed in an eggplant is something I would love to try!!! I love your sense of humour! Great idea to stuff the veg to go with your title. I think we would all love to say it so that someone who makes life difficult but best get the frustration out on the veg! This is one of my favorite recipes of all time! Delicious!! !